I get a lot of questions about how I run academic groups in my classroom, so I'm finally writing a post specifically explaining how we manage to run literacy groups in my classroom students with with moderate to severe disabilities. It seems like in many classrooms, the biggest barriers to running groups are: understaffed and students' negative/ undesired behaviors, and although my classroom is still far from perfect, I've found a solution to these issues that is working for our classroom for now! You can grab these visual schedules for FREE here. All groups do each of the following activities every day. Every activity is differentiated based on the groups' and individual student's needs. Guided reading- (either guided reading or shared reading, depending on groups' needs/ level). During the reading lesson, we typically read a book and then do a comprehension check, a book review or a writing prompt after the story. If you're new to guided reading, check out this post from The Measured Mom for a short but great explanation. 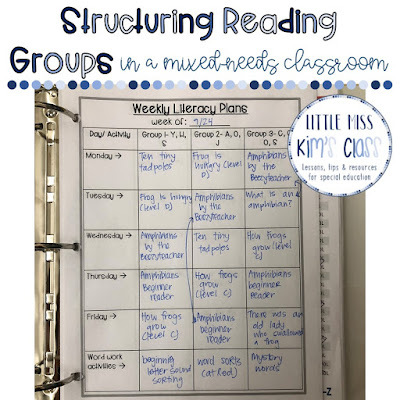 If you're new to shared reading, check out this post from The Measured Mom for a short but great explanation. Example of how I plan out books for the week for groups. I pick books based on weekly themes. These comprehension checks can be found here. Free CVC cards from The Teaching Texan here. These short vowel activities can be found here. These word work activities can be found here. Writing- We do a variety of activities during writing time. Many students work on activities related to the letter of the week, some are tracing or writing letters/ their names, some are writing/ copying sentences or paragraphs, etc. Below is the sequence I follow for the week for many of my students. I keep the tasks/ activities the same for each day of the week, but the worksheet is changing based on the letter of the week. I do this so that students can get used to the set up of specific worksheets but learn new information. I make copies of the writing worksheets, comprehension checks and book reviews for the entire week and keep them in this tub. Alphabet check from Proud to be Primary here. Alphabet work from my TpT shop here. Independent reading/ listening center- Our independent reading time isn't during our actual reading block. It's a part of our center time because that worked better for our schedule, but I still wanted to ensure that our students were participating in it. Students are able to choose if they want to read/ look at books independently at their tables or go to the listening center during this time. 1) Start by teaching students to do breaks/ play quietly and independently. If your students can quietly play independently at a table, then you and your paras can focus on running literacy groups and managing behaviors during those literacy groups. Teaching students to do this often takes many weeks and a lot of effort, but it's SO WORTH IT! During this independent play time, my students will do activities like: play checkers, play with blocks/ magnatiles, play with trains/ cars, etc. My expectations during this time are: students are sitting at a table and whispering if they're playing with a friend. I typically give them 3 toy/play options each week and I rotate/ change the choices every week. 2) Train paraprofessionals how to run literacy groups effectively. I was taught that paras should be running academic groups and taking data, as long as the teacher trains them how to do it and continues to give them coaching around it. Paras aren't just in the classroom to manage behaviors and do clerical tasks, so train your paras how to run academic groups! 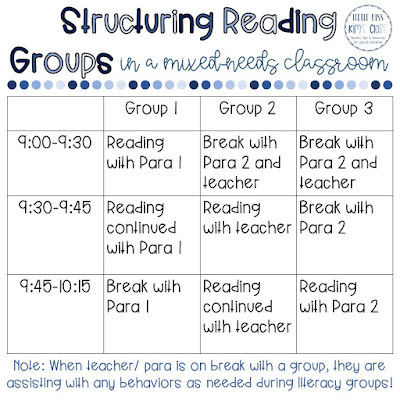 3) Stagger your reading groups. Don't run all your groups at the same time, because then when on students starts to struggle behaviorally or leaves the classroom, then an entire group is left without a teacher. If you stagger groups, then you'll always have a "floater" staff member to assist with those behaviors. I have a total of 3 literacy groups (let's call them group 1, group 2 and group 3). Our classroom staff includes: myself and 2 paraprofessionals (let's call them Teacher, Para 1 and Para 2). Each group has 3-4 students in it. We have numerous students who frequently elope/ leave the classroom to avoid work so we need a "floater" staff member available at all times to ensure safety and to avoid leaving a group without a staff member. At first, we were running literacy groups for group 1, group 2, and group 3 at the same time, but then when a student would leave the classroom, a group would be left without a teacher or a teacher would be trying to cover 2 groups, which was really unfair to the students left in the group in the classroom... so we started staggering groups and it was magical! Here's how we stagger and run literacy groups now and it's been working wonderfully for weeks now! Now no group is missing out on instruction if a student elopes during work time! Group 2 and group 3 are playing independently and quietly at tables. Para 2 and teacher are supervising break and supporting with eloping behaviors for group 1 literacy group. Group 2 is doing literacy group with teacher. Para 2 supervises break for group 3 and supports with eloping behaviors of group 1 and group 2. Group 3 is doing literacy group with Para 2. 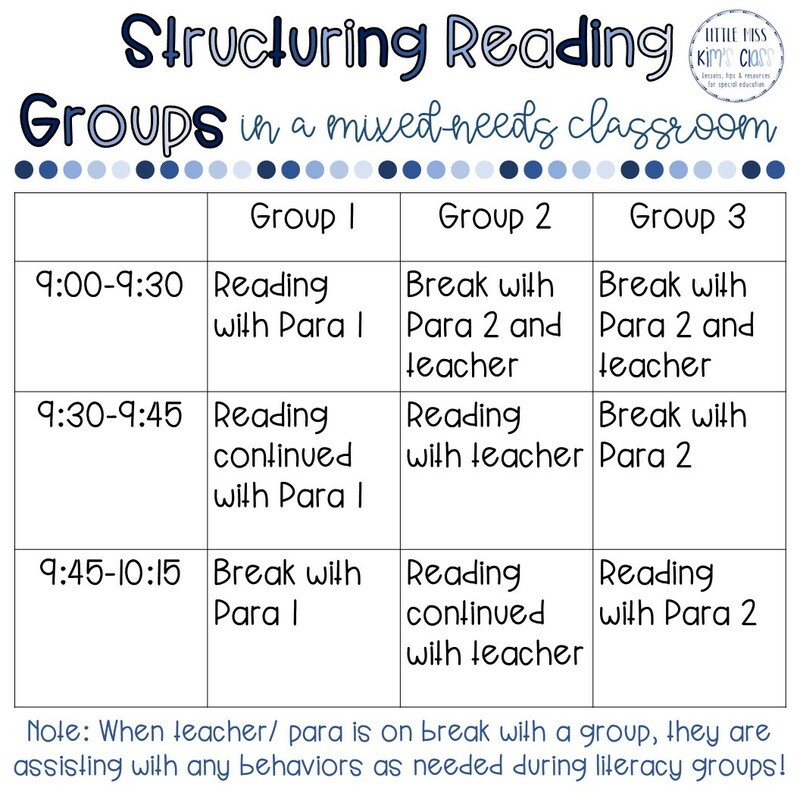 Group 1 goes into break time and Para 1 supervises break time and supports with eloping behavior for literacy groups 2 and 3. We switch what groups we work every day. So I work with each group every 3rd day. I tried to explain this as best as possible, but I know it might seem a little confusing, please leave me any questions you have about it in the comments! We spent the first few weeks of school teaching students how to stay at their work space and play quietly. Staggering groups like this would be really tough is students are still learning to play/ engage in break independently. It allows us to always have 1 or 2 "floater" staff members supervising break time with students who can support with eloping behaviors due to task avoidance. Leave any questions you have in the comments and I'll get back to you! Do you stagger your groups or have any tips to share with me/ others to help make groups run smoothly in mixed-needs classrooms?